Thanks to hurricane Ike, my Dad lost an elm tree in his yard. The tree was a good 18 inches in diameter, so I ask for some of the wood to make stump seating. 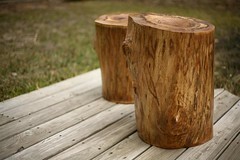 I know I could buy stump seating from West Elm and other furniture companies, but these logs have a story. You will also quickly learn that I have a big problem paying for something I can do myself. I’m not sure if that’s because I’m crafty or just cheap. Either way, I have a lot of homemade things around the house. There isn’t much to this project. I simply peeled the bark off with a chisel and used an old craftsman belt sander with 36 grit sandpaper to sand it down. And then I finished it with about 5 coats of exterior use poly-urethane and sanding lightly with 200 grit paper between coats. No Comments on "Elm Stump Seating"